Clean antiseptic Singapore shrouded in haze while we have floods. Militant party-list groups make overtures about joining minority for effective fiscalizing, but are they only targeting couple of juicy chairmanships? Where Makabayan swings its vote for Minority Leader would be crucial. First, fake returns, now fake proclamations from fake board of canvassers in Baybay City? 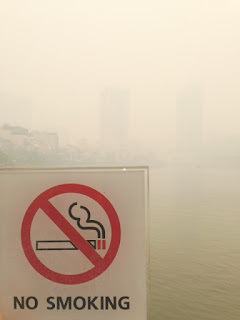 The above photo says it all in the current contradictions in the tiny island state of Singapore: a rabid No Smoking in distinct areas, but in the background its proud skyscrapers are hardly visible through a deadly haze that has shrouded the state in the past two weeks. The haze was caused by the burning of huge hectares of forest lands in the big island of Sumatra in Indonesia, in preparation for the planting of palm oil. Singapore, directly in the path of the burnings, caught all the smoke, resulting in a thick blanket of haze expected to last some months. The Singapore government is quite angry about the haze and has complained to the Indonesian government, but the latter retorted that many of the corporations that caused the burning are Singaporean-owned. Now the two nations are talking about the problem, which is sensible. As of yesterday, the pollution standard index (PSI) reading, which measures the air quality, had already breached 400 (anything over 100 is considered dangerous). The more meaningful PNI2.5 index similarly breached 100 and is now at 270. Singapore is one of the world’s strictest in adhering to environmental laws, but now it’s on a virtual shut-down, as supply of masks has run out and everyone is advised to stay indoors, especially the sick and elderly. Singapore is indeed so antiseptic, clean and orderly that an environmental problem like the haze would be so tough indeed for its people to handle. Inevitably one is encouraged to make comparisons: how would the Filipinos, so used to putting up with so many tough environmental problems, oftentimes simultaneous, handle a problem like that? Civic leader Lynn Gamboa of Bacolod, commenting on the internet, said it succinctly, “Singapore has the haze. We have the floods.” Indeed, we have many more problems. News reports indicated that militant elements in the House of Representatives, led by party-list groups under the “Makabayan bloc,” are contemplating splitting with the LP-led majority in the House. Talk is that the militants are thinking of joining the Minority whose leadership is currently being fought over by Leyte Rep. Martin Romualdez, president of Lakas-CMD, and come-backing San Juan Rep. Ronaldo Zamora, who won under a local party, Partido Magdiwang. Minority Leader Danilo Suarez is “graduating” as three-termer, and who between the contenders the seven-member Makabayan bloc swings its vote to would be critical. When I read this report I was actually glad, because I feel that many crucial issues facing the country could be aired in Congress with the help of the militant groups, especially after one militant leader was quoted as saying the party-list bloc would sponsor an investigation into the PCOS machines and May 13 electoral fraud in the 16th Congress. I felt that the left-wing party-list groups would be the best to handle this issue since the LP-allied district representatives cannot be expected to move against Malacanang and its subaltern, Comelec. We saw how an overwhelming number of House members were led by the nose in the RH issue, thanks to the PDAF dangled to them; but it was also the Alliance of Concerned Teachers' Rep. Antonio Tinio who exposed the Palace bribery in the Manila Standard, which was never denied by Malacanang nor the solons. I checked out this report about militants splitting from the LP coalition with a veteran member of the House, however, and he readily shot down my enthusiasm by saying, “Don’t bank on it.” He claimed that the eve of an incoming Congress is always season for fierce competition for committee chairmanships--- and the militants are no different from the district reps. In addition, there’s the central fact of political life that if the militants forsake the LP coalition and join the minority, they could lose their P70 million annual PDAF---just like what happened to the Arroyo brothers and former Zambales Rep. Mitos Magsaysay in the outgoing Congress. Are they as idealistic as Mitos? 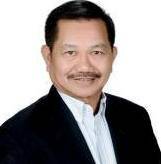 Besides, his analyst points out, the Makabayan group remains terribly jealous of its keenest rival, Akbayan, whose members enjoy juicy posts in the administration, led by Presidential Adviser on Political Affairs Ronald Llamas, Commissioner on Human Rights Loretta Rosales, Anti-Poverty Chair Joel Rocamora and Undersecretary for Political Affairs Tomasito Villarin. Hindi magpapahuli ang Makabayan sa Akbayan. (Next: the battle for oversight committees with their huge budgets). Readers will remember that I wrote several blogs ago about the 38-year old UNA candidate for mayor of Baybay City, businesswoman Malot Veloso Galenzoga, who, with the support of the religious and the academic community there, courageously challenged 83-year old reelectionist LP mayor Carmen Loreto Cari of the powerful Cari/Petilla dynasty of Leyte. I had termed the situation in this biggest city of Leyte as the microcosm of the country’s depraved political system, especially of the ills of the dynasty system. I reported here that two days after the elections, with only 25% of voting results transmitted electronically, transmission to central server was suddenly stopped and the Comelec BEIs began transmitting manually from various precincts. And in full violation of the AES Law and the Omnibus Election Code that states that only electronically transmitted results can be the basis for proclamation of a winner, Cari was proclaimed as having won by what Malot claims is an illegally composed Board of Canvassers---led by a certain Susan Collamar, against Comelec Resolution no. 3848. 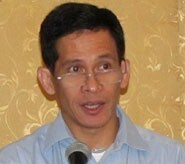 Malot immediately filed for failure of elections with Comelec and demanded new elections in Baybay. It was at this point, claims Malot, that her opponent's dirty tricks department got to work: A week or so later, she received what appeared to be a genuine proclamation of her as winner of the Baybay mayoralty race, signed by no less than Comelec Chair Sixto Brillantes and attested by the other commissioners. Great rejoicing erupted in Baybay City over this and Malot’s followers, including a number of academic institutions, began hanging tarpaulins of support---to celebrate the end of the 32-year “dictatorship” by the Cari clan. But the communication from Comelec turned out to be FAKE again, and Malot’s supporters suspect it was churned out by the Cari camp to make Malot look like a power grabber. In fact Mayor Carmen Cari was quoted in a national newspaper as warning her youthful opponent that she’d take her and her supporters to court if they continue "to confuse the people about the real results of the elections." When news spread about the fake Comelec Board of Canvassers and the fake Malot proclamation document, the academe, religious, peasants, workers and other sectors staged a peaceful but emotional indignation rally at City Hall---the first ever such rally staged vs. the 32-year Cari dynasty. It culminated with Fr. Patrick Paraiso decying the alleged fraud, massive cheating, vote- buying and terrorism of the Cari era. The Comelec should act with dispatch on Malot’s pending protest case, if only to calm down roiled political emotions in Baybay. But would it have the guts to go again a super-entrenched dynasty with strong Palace connections? It seems that the 152nd birth anniversary today of our National Hero, Dr. Jose Rizal, was hardly noticed due to one big factor---the floods. Everyone’s talking about last Monday’s deluge and how myriad folks were caught up in the horrible four-hour traffic on EDSA that night. What was particularly striking in some friends’ stories was how motorists sought to avoid driving into deep pools of floodwaters on EDSA, deliberately stopping at their edge and waiting for traffic to ease up first before moving forward---doubtless to avoid drowning their engines. Ganoon kalalim ang baha. Such motorists' tactics, however, contributed to the hideously snarled traffic. I have vivid memories as a young child watching the flooded street in front of our home along Sta. Mesa Blvd., Manila with my many siblings, our legs dangling from our second-floor ventanillas, as people sailed up in bancas in the converted sea. Over the years since Mayor Antonio Villegas’ time I remember hearing politicians quarrelling over flood control projects, denouncing corruption therein and blaming one another for inefficiency, etc. Many decades later they’re still playing the blame game. Cabinet Secretary Rene Almendras sounded truly pissed off in an interview this morning as he sought to deflect the blame from the Cabinet and his boss the President. Almendras blamed the informal settlers who throw garbage all around, clogging the water docks, the politicos coddling them, etc., etc. There’s also news that the President ordered sanctions imposed on local executives who would allow informal settlers to once again squat along the esteros and other waterways. But some wise guy on FB argued that P-Noy is to blame, for he raised the hand of those very same local execs in front of their constituents, the informal settlers, in the recent elections. Secretary Almendras is not really succeeding in deflecting blame---for a major reason. As Manila Times’ Rigoberto Tiglao pointed out in his column last Sunday, the Aquino administration threw out the flood control project in Laguna de Bay that could have significantly mitigated this perennial problem. The P18.7 billion Laguna Lake Rehabilitation Project contracted by the Arroyo administration with the 150-year old Belgian dredging firm Baagerwerken Decloedt En Zoon (BDZ) involved the dredging of some 4.6 million cubic meters of silt and waste of Laguna de Bay, to enable it to take in floodwaters from Metro Manila, with help from the deepening of the 7-km. Napindan Channel in Taytay. What’s more, the project featured a concessional loan, with Brussels providing an outright P7billion grant which, as Bobi pointed out, would have been the biggest development aid that country would ever have given us. But five months into his term, President Aquino threw out this contract with little explanation beyond stressing that it was studded with corruption, having been contracted by the Arroyo administration, to the consternation of the Belgian company. Unfortunately the Palace offered no alternative solution to the flooding problem. In a previous column I wrote about how the Belgian King was so disturbed by the cancellation and the Belgian Prime Minister tried to seek reconsideration, mainly because it was good for us Filipinos, assuring that everything was above board with this contract. On the other hand, Tiglao noted that the Bangko Sentral and P-Noy’s Justice Secretary Leila de Lima checked out this project and found it ok, while his officials “have been unable to produce any single evidence of graft involving the project." He also pointed out that the unilateral cancellation of the Belgian project could result in P6 billion of taxpayers’ money lost, as the government has to pay very soon the P420 million penalty for cancellation of the BNP Paribas Fortis bank loan---amid a suit against the government filed by the Belgian company at the World Bank’s International Centre for Settlement of Investment Disputes (ICSID). This unilateral cancellation in mid-stream is admitted by the foreign chambers of commerce here to be among the reasons (along with the Fraport dispute over NAIA 3 dating from the Erap administration and the cancellation by the Aquino administration as well of the Arroyo contract for steel ports with the French Matiere Co. ) why foreign direct investments have failed to come into our country---unlike the way they’re pouring into Vietnam, Myanmar and Cambodia and the rest of Asean. With this dispute that the government is involved with in an international court and the gargantuan fees it will pay foreign law firms, it might have been better if it had just gone ahead with the Laguna Lake dredging. Individual members of AES Watch, the umbrella organization of IT experts and other professionals that monitored the two recent elections, have urged the Ombudsman to investigate two Comelec administrations under Sec. 40 of the law creating that office. One is the Comelec under former Chair Jose Melo during the 2010 presidential elections and the other under Chair Sixto Brillantes in the recent 2013 elections. The AES Watch member-complainants, led by former VP Teofisto Guingona, accuse the two Comelec Chiefs and their fellow commissioners of graft and corruption for alleged conspiracy in the approval and use of the “inefficient and highly suspicious” PCOS machines---thereby placing in grave peril the sanctity of the ballot in both elections. As Fr. Joe Dizon, co-convenor of AES Watch, put it, millions of voters were disenfranchised last May mainly because of the 18,000 PCOS machines that malfunctioned. Significantly Smartmatic’s officials, led by its Asia-Pacific President Cesar Flores, were also implicated in the court suit, and rightly so, for it sold lousy equipment to the gullible Comelec officials. Former North Cotabato Gov. Emmanuel “Manny” Piñol’s testimony against the PCOS machines is only one of legions of complaints against those damned machines; and the way suits promise to rain on Smartmatic, it would need more than just the ACCRA Law Office to defend it. In the last elections, he said he almost suffered the fate of thousands of qualified voters whose ballots were rejected outright by the PCOS machines. Pinol said he persisted in feeding his ballot into it and it was only on the third try that the machine accepted it. Piñol related that in New Antique, Mlang, North Cotabato one of his supporters whose ballot was rejected three times insisted that the feeding into the machine be continued, until on the 15th try it finally accepted his vote. “But what about those who did not persist in doing so?" 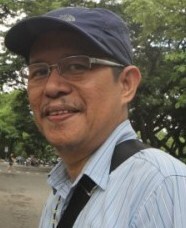 Manny Piñol asserted: “There is no law which says that those whose ballots were not accepted by the PCOS machine after three attempts shall be disqualified from voting; that ballots which were shaded beyond the circle opposite the candidate’s names shall not be counted; that voters whose dirty hands smudged their ballots shall be disqualified from voting." Yet all of these happened in the 2010 and 2013 automated elections, Piñol stressed---so that it’s now time for citizens whose ballots were rejected and whose votes were not counted to come forward and file their complaints. He said these will all be consolidated into a suit which he intends to refer to legal experts who will take the matter up with the Supreme Court---"so that in the next elections the monster called the PCOS Machine will no longer be used." He asks all complainants to forward their names and addresses to Atty. Rene Alexis Villarente at renealexisvillarente@yahoo.com. Candidates at all levels are without exception required by the Omnibus Election Code to file their statements of contributions and expenses with the Comelec, including those who lost the elections. An interesting query in this connection: did local candidates include in their statements the amounts they spent for vote-buying? The fact is that there's probably hardly any local candidate who did not buy votes and many commentators have noted that the amounts spent in the recent elections increased far more than at any other time in the past. As in past elections, vote-buying was limited mainly to the great masses of the electorate and the upper classes registered shock and dismay/disgust at the depravity to which the masses had sunk as they converted their votes into commodities for sale to the highest bidder. But actually it's the political ruling classes that corrupted the electorate, capitalizing on the voters' poverty in order to entrench themselves in power. And the Comelec contributes to the corruption by looking the other way. Could anyone imagine that in an obscure town in Northern Samar the going rate for local votes ranged from P7,500 to P10,000 per vote? The sister of a losing congressional candidate in a city south of Manila recounted to me how she saw a very long procession of people on election morning proceeding to a big empty lot along the main road. Curious, she was told that these folks were being escorted by followers of a mayoralty candidate into that empty lot, where they were to receive a certain amount for their votes. Alarmed, she called up the local Comelec official about the anomaly, but the latter just told her to file a complaint. In other words, as Atty. Macalintal put it, “the court will not entertain you if you come with dirty hands.” And which politician has clean hands in this day and age? Hence, no complaint. I spoke to Dr. Felix “Lex” Muga of the Ateneo Math Dept., who chairs the Mathematical Sciences Division of the National Research Council of the Philippines, one of the advisory councils of the DOST. Dr. Muga is credited with projecting the 60-30-10 “linear arrangement” exhibited in various areas in the recent senatorial elections. He had looked at the 1st to the 16th canvass in the elections as well as the consolidated voting picture of the various regions, and presented them in graph form---and voila, this linear pattern. I queried him on other areas he and his team had studied since then, and he cited various cities of Mindanao, notably Bislig, Tandag, Davao City, Cagayan de Oro and General Santos, as well as some areas of Western Visayas and the NCR. He said the same 60-30-10 pattern emerged in these areas, with just slight variances not significant enough to divert from it. Muga said this uniformity that disregarded factors such as traditional bailiwicks challenges the credibility of the PCOS-conducted elections. I told him that the public appreciates the results of his study, so that he and his team should continue it until they have graphed results of the entire country. 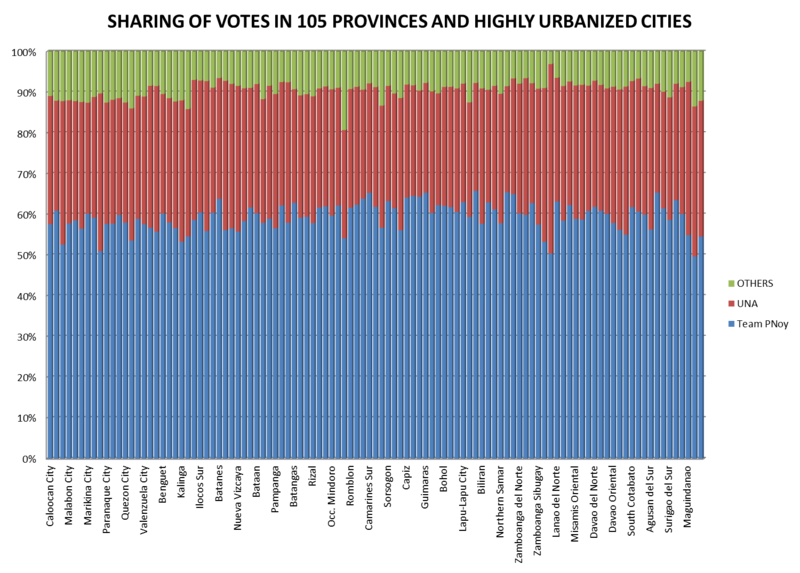 It has become a patriotic duty on the math scientists' part, to reinforce our faith in the electoral process. Dr. Muga stressed that he and many other math scientists from various schools are ready to continue, but they need to get down to the Statement of Votes (SOVs), the tallies of votes from the precinct level that are consolidated into COCs at the municipal/city levels. Dr. Muga said that as per RA 9369, the Automation Law, digital files of the elections should be made fully available to the public, but they're not. In fact, he laments that a full 18% of the votes remains unaccounted for and from Comelec Chief Sixto Brillantes' pronouncements they won't enter into the national tally anymore (assuming 75% voting attendance, this means effectively disenfranchising some seven million voters---BOC). Even the Random Manual Audit (RMA)---required by law to be conducted right after polls close in at least one precinct per each of the 234 congressional districts across the land---has only finished audit in 161 precincts more than a month later. The variance between PCOS machine results and the RMA count, stressed Dr. Muga, could lead to a miscount attributable as errors of the PCOS machines, and this could affect especially tight races, e.g., the mayoralty race in Manila could really be “statistically tied” between Alfredo Lim and Joseph Estrada. Lex Muga stressed that there should be a PARALLEL MANUAL COUNT to settle the credibility issue once and for all, but he admitted that there could be a question of management, e.g., how many teachers would be involved in the recount, a budget, etc.? I checked out with Namfrel Secretary-General Eric Alvia the matter of producing SOVs that Dr. Muga and his team badly need to confirm the existence of a linear pattern for the rest of the country. Alvia said the problem is that most SOVs and COCs are inside the various ballot boxes, together with the ballots. He recalled that Namfrel had verbally requested copies of these aggregated documents from Comelec, and it had agreed to give the watchdog hard copies after proclamations of winners were made; but to date Comelec has not complied with this request. Going down to the SOVs is imperative if we are to remove all doubts about the credibility of the elections. Note, for instance, that Namfrel covered 141 precincts and processed 126 of them, and in these the watchdog had noted that accuracy rating of the PCOS machines was lower than 92%. As Sec-Gen Alvia noted, that’s lower even than the accuracy rating of the 2010 exercise and certainly lower than the 99.995% accuracy rating demanded by Comelec from its machines-provider Smartmatic in the contract. On the other hand, note that Comelec Chair Brillantes has virtually preempted the results of the RMA being conducted by the triangular group headed by PPCRV Chief Henrietta De Villa---by saying that the accuracy rating of those PCOS machines in the RMA check is 99.995%. In other words, right on the nose of the law’s requirement. Wonderful, except that the RMA by De Villa’s group has stood UNFINISHED at 161 out of 234 precincts. In the 2010 elections, De Villa's group failed to finish the RMA even after two months, and yet it again bagged the same job for 2013. But now it's again running late in completing this job and yet its finding DAW, according to Brillantes, is an accuracy rating on target down to the last contracted digit. He's contemptuous of the Filipino people’s intelligence.